It was determined Sunday afternoon at the NCAA hockey bracket selection show that the No. 13 Boston University men’s hockey team will be back in Worcester for the NCAA Northeast Regional for the first time since 2006. BU will face No. 4 Cornell University Saturday afternoon at the DCU Center. Since the NCAA adopted the neutral site regional system in 1992, the Terriers have played in Worcester nine times with varying success. Aiding greatly to BU’s appearance numbers is the fact that in the years the Terriers have hosted the regional in Worcester, they have advanced further in the tournament seven of those nine games (with 2002 and 2005 being the exceptions). 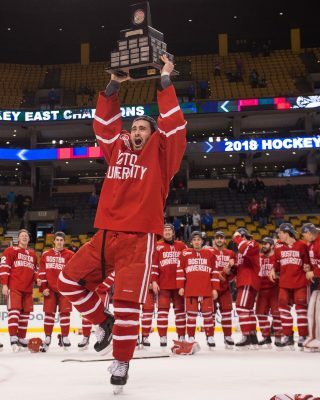 BU’s gamble to fork over the money to host in the early days of the regionals convened nicely with a historically-dominant time for the Terrier hockey program. BU qualified every year for the national tournament in the ‘90s except for 1999. 1993: BU avenged its 1991 triple-overtime loss to Northern Michigan University in the national championship game by dispatching the Wildcats 4-1 to advance to the Frozen Four in Milwaukee, Wisconsin. 1995: The Terriers again had a first-round bye and again got some retribution in the process. BU rolled past Lake Superior State University 6-2 on the way to the Frozen Four in Providence, Rhode Island. Just a year before, Lake Superior State beat the Terriers 9-1 in the national title game in St. Paul, Minnesota. The Terriers went on to win their only national title in the decade, beating the University of Maine 6-2. 2003: Despite finishing fifth in Hockey East, the Terriers used a run to the Hockey East championship game, where they lost to the University of New Hampshire 1-0 in double overtime. BU downed Harvard University 6-4 in to advance to the second round and play for a trip to the Frozen Four. 2006: After falling behind 1-0 early to the University of Nebraska Omaha, which made its first-ever tournament appearance in this game, BU would score eight of the next nine goals en route to a 9-2 shellacking of the Mavericks. Sandwiched in the goal scoring barrage was BU’s Chris Higgins hat trick. At the time, his three goals in 5:31 was the quickest hat trick in NCAA tournament history, until 2013 when Quinnipiac University’s Matthew Peca bested his mark with three in 3:12 against Union College. 2003: It was the same story on a different weekend for BU against UNH, as the Terriers failed to score on Wildcat goalie Mike Ayres for the second straight game. If it’s any consolation for BU fans, UNH then got steamrolled by Minnesota in the national title game 5-1 in Buffalo. 2005: North Dakota shutout BU 4-0 in the opening round. The then-named Fighting Sioux doubled up Boston College 6-3 to advance to the Frozen Four where the Sioux finally ran out of gas in the final against Denver, going 4-1. 2006: The worst of the worst, for sure. BC crushed BU 5-0 to advance to the Frozen Four in Madison, Wisconsin. BU had beaten the Eagles four other times that year, including the Beanpot championship game and Hockey East final. BU caught the injury bug at the wrong time of year, and did the one thing the could not afford to do: beat itself. BC’s Brian Boyle scored unassisted 6:24 into the game as Kevin Schaeffer turned the puck over right in front of his own net. Our recent record against the Terriers isn”t great, but prior to the break we seemed to be picking up a bit of momentum, which hopefully the lads will still be carrying after a 3 week break. I suspect there is only 1 goal in this game, so hopefully it will be us scoring it.